Chris Kelly, one-half the hip-hop duo Kris Kross that scored a radio hit with "Jump" in the early Nineties, has died, The Associated Press reports. Kelly, 34, was found unresponsive yesterday afternoon in his home and taken to Atlanta Medical Center, where he was pronounced dead. The police are investigating the death as a drug overdose, according to The Atlanta Journal-Constitution. An autopsy will be performed today. Known as "Mac Daddy," Kelly and his groupmate, Chris "Daddy Mac" Smith, were discovered by a 19-year-old Jermaine Dupri while performing at an Atlanta shopping mall. The budding hip-hop mogul brought the duo to Ruffhouse Records, which released their debut album, Totally Krossed Out, in 1992, when Kelly and Smith were 13 and 12 years old. 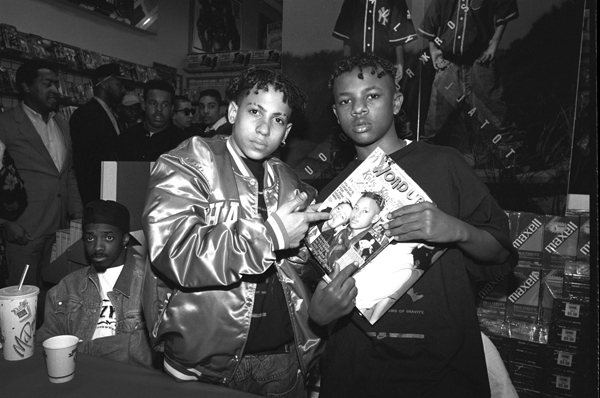 As Kris Kross swiftly gained popularity among teens with their radio-friendly rap and trendsetting style (they wore their clothing backwards), the album reached Number One, selling four million copies, and its lead single, "Jump," topped the singles chart for eight weeks. The group was embraced by older music stars, t0o, appearing in music videos by Michael Jackson, Run-D.M.C. and TLC. Kris Kross released two more albums in the Nineties to lesser success before Kelly and Smith went their separate ways. In February, the duo reunited to perform their at the 20th anniversary concert for Dupri's So So Def label. Kelly's mother, Donna Kelly Pratte, addressed his death in a statement last night. "It is with deep sadness that we announce that our beloved Chris Kelly has passed away on May 1st," the statement read. "To millions of fans worldwide, he was the trendsetting, backwards pants-wearing one-half of Kris Kross who loved making music. But to us, he was just Chris – the kind, generous and fun-loving life of the party. Though he was only with us a short time, we feel blessed to have been able to share some incredible moments with him. His legacy will live on through his music, and we will forever love him." Fellow entertainers expressed their condolences online, with Nicki Minaj tweeting "sending love to his family," and LL Cool J dedicating the song "14 Jump on It" to Kelly and tweeting, "May GOD embrace your soul & lift up your family."